The COURSES offered by the SFI Lab include graduate, undergraduate, and post-graduate professional courses and workshops in the domain of sustainable facilities and infrastructure systems. Click on the links below to learn more about our courses. In Fall 2010, ten students taking BC 5134 took a field trip to Chicago to volunteer and attend the GreenBuild Conference and to conduct a study on project manufacturers’ claims related to green building products. There’s truly nothing like a ten hour plus van ride to truly get to know each other! student Naveen Sadhi and Ph.D.
asked to describe their products and answer the question, “What makes your product green?” The 2010 study was a sequel to an earlier study investigating manufacturer perceptions. The study will be repeated over time to evaluate how manufacturers’ perceptions of their products’ green attributes change over time. 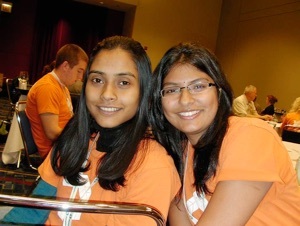 Students also worked as USGBC volunteers at the conference in exchange for admission to the sessions and trade show.